What's So Great About Charlottesville? 11 Reasons Why We Love It. Everyone knows about Monticello and UVA’s Rotunda, but we want to share with you some next-level stuff. Here are our top reasons for loving Charlottesville that we think you’ll dig too! 1. Farm-to-fork / locavore love..
Charlottesville is a town that loves its farmers! Restaurants like The Ivy Inn, Red Pump Kitchen, The Local, Rocksalt, Mas Tapas, Feast!, The C&O, Brookville Restaurant, and The Whiskey Jar boast seasonal menus with locally produced ingredients. At least five well attended farmers markets dot the area, and Timbercreek Market features both a grocery and a restaurant spotlighting meat and produce raised at their own nearby farm and other regional farms. Farms and orchards across the five-county area surrounding C’ville offer u-pick fruits—peaches and apples abound in the summer and fall months—and many are destinations, with farm stores and tours, plus educational, culinary, and tasting events. A staggering number of farms near Charlottesville raise livestock and produce meats—beef, chicken, turkey, pork, eggs, and lamb. And, last but not least…wineries! Vineyards and wineries are all over this part of Virginia; plus on-site and remote tasting rooms provide plenty of chances to try them all. Charlottesville isn’t all vineyards and wineries, though; it’s home to bunches of breweries too! Some local favorites are Three Notch’d, Champion, South Street, Hardywood Pilot, and Reason Beer. Hop on a Hop On bus for a tour, or check out Brew Ridge Trail’s self-guided tour for some farther afield joints like Blue Mountain Brewery and Barrel House, Starr Hill, and Wild Wolf. Naturally, the home of Dave Matthews Band is a buzzing musical hub. Despite Charlottesville’s relatively small population (around 47,000), big acts grace our many stages. Recent and upcoming passers-through include: Paul McCartney, U2, Lady Gaga, Jay-Z, Bruce Springsteen, Mavis Staples & the Blind Boys of Alabama, Calexico, North Mississippi All Stars, Ani DiFranco, David Crosby, Smokey Robinson, Alison Krauss, Trey Anastasio, Kurt Vile, Indigo Girls, Keith Urban, Chris Stapleton, and Rufus Wainwright. 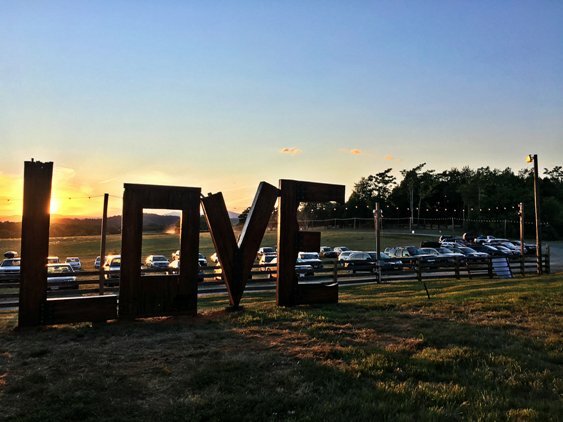 Oakridge Farms in nearby Arrington, VA is home to the wildly popular annual jam band festival LOCKN’. 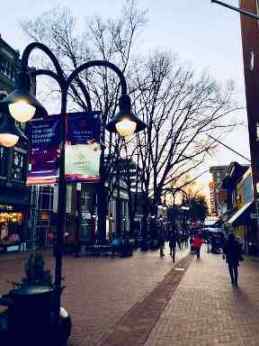 And, Charlottesville’s musical pride and joy is the world’s largest independent music management company, Red Light Management, which was founded in the early 90s to help Dave Matthews Band go big, a venture that catapulted both into unimagined success. Charlottesville’s restaurant scene goes far beyond hyper-local farm to table, with so much available in a small, navigable city. Its proximity to Washington, DC lends Charlottesville a generous sprinkling of international flavor compared to other Southern cities. Indian, Korean, Thai, Italian, French, Turkish, Mediterranean, South African, Afghani, Chinese, Moroccan, and Japanese restaurants are among C’ville’s top-rated; and of course, a healthy helping of Southern restaurants keep the city in grits and gravy. Maya (upscale Southern), Public Fish & Oyster, Lampo (Neapolitan pizza), Fleurie (upscale French), TEN (sushi), C&O (country French), and Milan Indian Cuisine are some favorites among locals. It’s no surprise that Georgia O’Keeffe’s adopted home would have a thriving arts scene. Galleries are abundant, of course, but let’s focus on how Charlottesvillians can engage with art as a living, breathing entity. 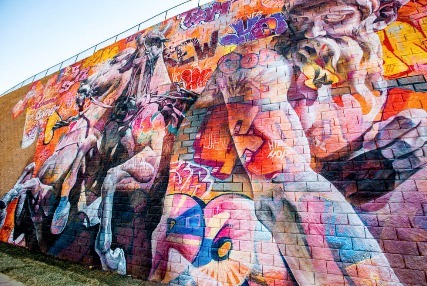 Just to name a few: The Progressive Arts Institute, at the time of writing, is seeking artists for collaborative residency and muralists to work on two public pieces. The same institute offers a semester-long program for children to discover their talents while working with established artists. IX Art Park is “a walk-through, sculptural, mural-festooned Mecca that’s free and open for the public to wander, night and day,” created out of a former industrial area, hosting public events such as the We Are Here Diversity Festival, renting spots for private events, and holding space for visitors to experience in their own way. C’ville Arts at Downtown Mall is a cooperative gallery for regional artists to sell their work. And, Live Arts is a volunteer theater company for drama, dance, music, and comedy. 6. World class hiking/biking trail, right downtown! 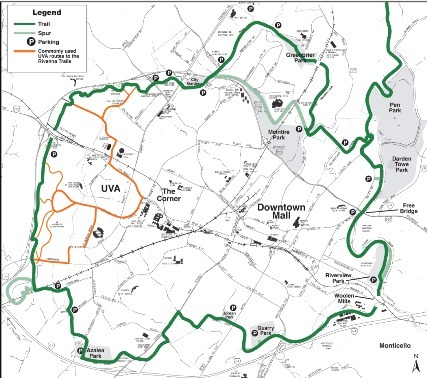 Take a lunchtime stroll or spend the whole day exploring Rivanna Trail, an urban wilderness trail connecting six city parks around downtown Charlottesville. This beautiful greenspace serves multiple purposes of protecting the city’s watershed and providing outdoor education and recreation for urbanites. Volunteers and city government have worked hard to preserve and maintain this gem so residents and visitors can continue to enjoy it. Since Rivanna Trail is right in town, you can pop off the trail nearly anytime for a beer at one of our local breweries or a bite to eat. Downtown Mall, or The DTM, is a pedestrians-only district right in the heart of downtown. Brick sidewalks and historic buildings give it an old-city charm, but the Freedom of Speech Wall (where visitors can write anything they like in chalk) and the 3500-capacity Sprint Pavilion (hosting concert events, including Fridays After Five) remind you Downtown Mall is intentional urban renewal at its best. Shop for antiques, vintage clothing, old records, and rare, antiquarian books, or browse the latest trends in designer duds and jewelry. Peruse exotic wares from street vendors, and get your locally farmed groceries at the Saturday City Market. The beautiful, historic Paramount and Jefferson Theaters showcase live theatrical performances, films, and touring bands. Dozens of restaurants serve cuisines for every palette and budget, and something can be found to munch on at any time of day or night. 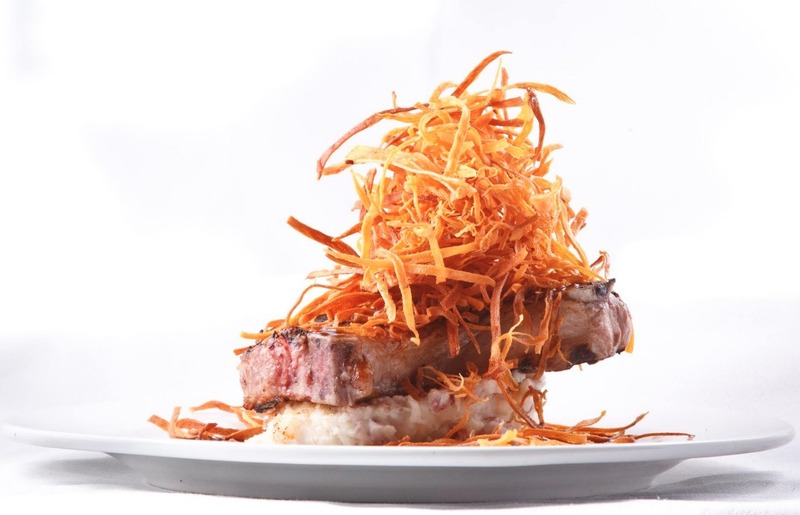 Some hot spots include Downtown Grille, for steak, seafood, and locally sourced side dishes; Bizou casual French; and Citizen Burger Bar, a beloved sports bar. Nightlife at Downtown Mall is no slouch either—The Whiskey Jar, Main Street Annex, and Zocalo, among many others, offer food, drinks, and live music into the wee hours. Flanked by two small mountain ranges, and situated just a few miles from the breathtaking Blue Ridge Parkway, Charlottesville is blessed with gorgeous views in nearly all directions. The Blue Ridge Parkway and Shenandoah National Park afford Charlottesvillians endless hiking, biking, lodging, camping, fishing, swimming, and sightseeing bounty. Maybe you want to set off on the roads and trails on your own, or if you prefer a more interactive experience, take advantage of the National Park’s many education programs and activities. Engagement programs for children and adults enable families to connect with the rich and diverse wildness of Southern Appalachia. Youngsters can become junior rangers, participate in an art competition, or join an adventure program. Other fun mountain experiences include rope swinging and swimming at Blue Hole, tubing the James River, and ziplining in Luray. 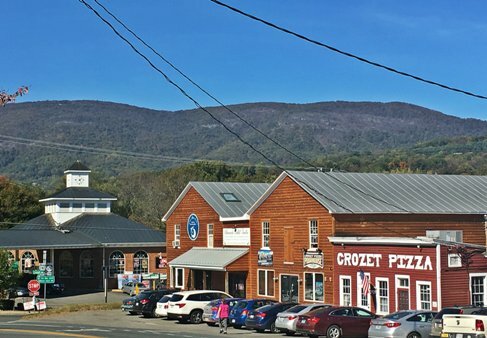 Just 15 minutes from downtown and higher up into the Blue Ridge, is the little town of Crozet. 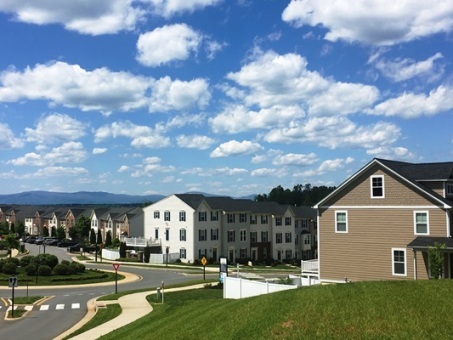 With a beautiful and rustic Northern-Exposure-esque downtown, some of the best mountain views in the Charlottesville area, and quick access to city amenities, Crozet is growing fast. But it isn’t all about proximity to Charlottesville, because Crozet has its own orbit. Crozet Pizza (Nat Geo’s pick for best pizza in the world! ), Starr Hill Brewing, Pro Re Nata Farm Brewery, Grace Estate Winery, Stinson Vineyards, and King Family Vineyards give this hamlet of just over 5000 destination status. Residents enjoy regular live music events at the breweries, local food and music at King Family Vineyards, a semi-annual Arts and Crafts Festival, and countless other weekly, monthly, and annual events. And, do not miss a chance to grab brunch at local favorite Fardowners Restaurant! 10. Doing summer right, festy style. Just as you’d expect, the whole Charlottesville area is popping with festivals throughout the warmer months. Some top picks include LOCKN’, Virginia Film Festival, Dogwood Festival, Tom Tom Founders Fest, Vegan Roots Festival, Lighting of the Lawn, and Festival of the Book. Sprint Pavilion hosts Fridays After Five, a weekly free live music event that runs April through September; and concession sales for this lively community gathering fund local nonprofits. Chiles Family Orchard hosts a “sunset series” May through September, where gazers can perch to watch the sun go down from atop Carter Mountain while enjoying hayrides and dinner too. And that’s just the tip of the iceberg! 11. Wahoos football and more. There may not be any major league sports in Charlottesville, but locals love their Cavaliers! Colloquially known as the Wahoos, University of Virginia’s FBS football team plays at Scott Stadium, which holds 60,000 people and often fills to the brim, particularly when the Tar Heels are in town. Nearby John Paul Jones Arena hosts UVA men’s and women’s basketball games. Cavaliers basketball’s biggest rivals are the UNC Tar Heels, Virginia Tech, and Duke Blue Devils. If you bring with you a loyalty to a hometown team, there’s no shortage of great sports bars either. The Lazy Parrot has 22 TVs and other diversions like darts and video games; Steelers fans can find a home at McGrady’s Irish Pub; Downtown Mall’s Citizen Burger Bar is full of big screens; and soccer fans will be in gooooooal glory at The Shebeen Pub & Braai. For more info on Charlottesville including weather, housing and employment, check out our Ultimate Charlottesville Moving Guide.